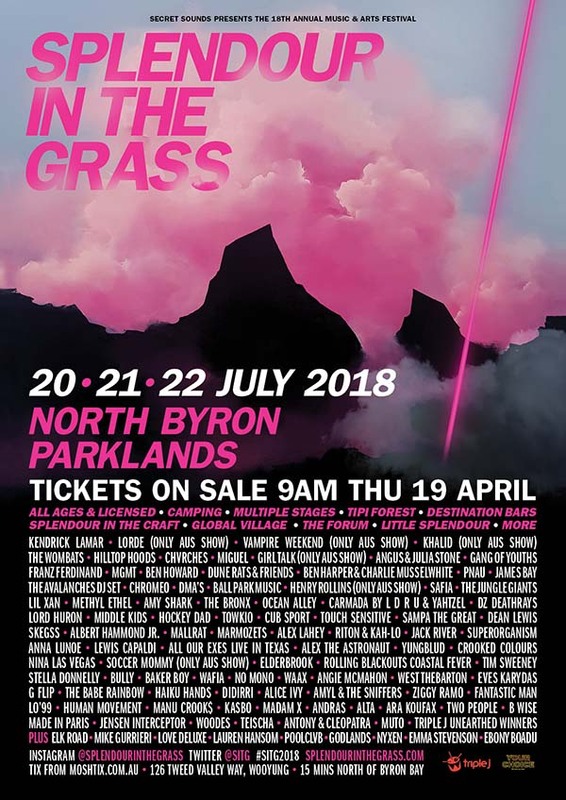 ​Splendour in the Grass, your annual hit of music and arts alchemy is back at North Byron Parklands from Friday 20th to Sunday 22nd July, with over 100 of the most exciting international and home grown artists touring right now set to grace The Amphitheatre, Mix Up, GW McLennan and Tiny Dancer stages. From the biggest and most innovative stars of hip hop and global names of indie rock, pop and dance to Australia’s most exciting established and emerging artists, Splendour’s team of 2018 is bringing one helluva bag of bangers and anthems for a generation to Byron this July. Onsite camping is available for up to 5 nights – with early entry into the campgrounds available from Wednesday 18 July - so bunk in for an easy and affordable way to experience Splendour. Travelling from afar and not keen to lug your camping kit? Pack light and book yourself into Tepee Love, Flash Camp, Tent City or Byron Bay Camping Hire. Bringing the kids? The Meadow, our family friendly campground is the place for you! If you’re being dropped off at the festival each day, please be sure to use the drop off points inside the venue only. Tweed Valley Way and the Pacific Highway are ‘no-go’ zones, please be safe and stay off busy roads. Tickets on sale 9am Thursday 19th April from Moshtix.